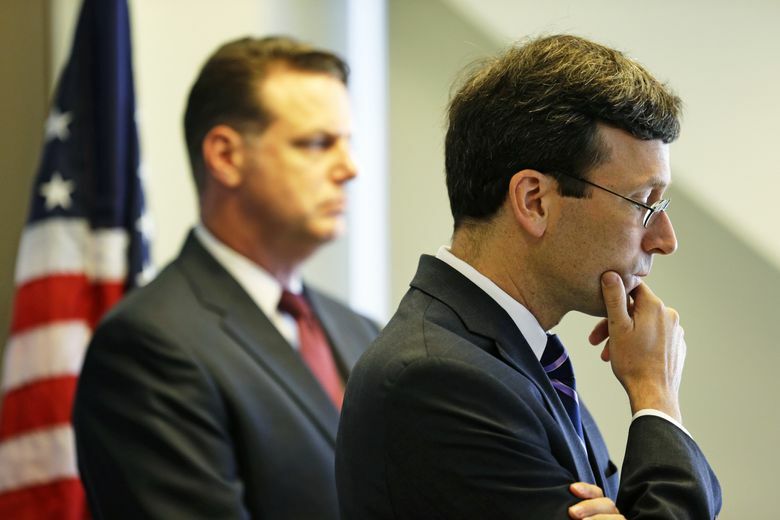 Washington’s attorney general says he is opening a criminal investigation into state Auditor Troy Kelley, separate from the federal charges he already faces. The Washington attorney general’s office has begun a criminal investigation into state Auditor Troy Kelley and his decision to hire a former business associate to a long-distance, part-time state job. The investigation, opened at the behest of Gov. Jay Inslee, is separate from a white-collar criminal prosecution by the U.S. Attorney’s Office into Kelley’s now-defunct real-estate reconveyance business, where Jason Jerue was vice president. Federal: In April, a federal grand jury returned a 10-count indictment against state Auditor Troy Kelley, accusing him of keeping millions of dollars in fees belonging to clients of a real-estate reconveyance firm he operated before becoming auditor. He’s also accused of tax evasion and lying in sworn depositions related to a civil lawsuit. He has pleaded not guilty; his trial is scheduled for Jan. 19, 2016. State: On Tuesday, state Attorney General Bob Ferguson said his office had launched a criminal investigation into Kelley’s decision to hire a former business associate to a long-distance, part-time job at the Auditor’s Office. The investigation was requested by Gov. Jay Inslee. He declined to say what laws might have been broken, and acknowledged that it is not unusual — or necessarily illegal — for elected officials to hire friends or cronies. “We are at the beginning of the investigation,” Ferguson said, adding that he had appointed two veteran office prosecutors, Todd Bowers and John Hillman, to run the investigation. However, Ferguson said it was likely unprecedented for one statewide elected official to ask his office to investigate another statewide elected official, although he added that the statute under which the investigation is being conducted is used routinely. Both Inslee and Ferguson have called for Kelley’s resignation. He has been on unpaid leave since May 1. Inslee’s spokesman, David Postman, said the governor wanted Jan Jutte, the acting auditor and a longtime office deputy, to get her feet on the ground before asking Ferguson to open the investigation. He said the governor’s and AG’s staffs have been discussing the issue regularly. “Given Jerue’s long history with Troy Kelley’s private business, which is now under federal investigation, and Jerue’s highly unusual work conditions in state government, the governor and attorney general felt there were questions that needed to be asked,” Postman said. “This is the place where Troy Kelley’s business and official functions met: He hired a close business associate for an unusual official state job with very little work product to show for it,” Postman said. After Kelley was elected auditor in 2012, he hired Jerue to a part-time job as a technical writer working from his home in California. Jerue made $22,884 in 2014, according to state records. Officials at the auditor’s office in Olympia said he was rarely seen. Federal agents have also subpoenaed Jerue’s work records. Jerue took a leave of absence after news of the federal investigation broke. He has since been dismissed from the agency. Kelley’s criminal attorney, Mark Bartlett, did not return a call for comment. Mark Firmani, whose public-relations firm has been employed by Kelley, 50, said they were deciding whether to address the investigation publicly. Jerue, 45, lives in Southern California and has proved difficult to track down. He was not named in the federal indictment charging Kelley. Kelley’s Tacoma home was searched in March, with federal agents seizing computers and documents relating to his operation of a real-estate reconveyance business, Post Closing Department, which operated from 2003 through 2008. Jerue, who had worked with Kelley at a previous firm in Los Angeles, was Post Closing’s vice president. In April, a federal grand jury in Seattle returned a 10-count indictment against Kelley, accusing him of theft for keeping millions in reconveyance fees belonging to Post Closing’s clients, and then trying to hide the money from the IRS. He is also accused of lying in sworn depositions taken in a 2010 lawsuit against him by Old Republic Title, which contracted with Post Closing to file reconveyance documents. Kelley, who was a Democratic legislator at the time, agreed to settle the lawsuit for $1.2 million. Kelley has pleaded not guilty to the federal charges and his trial is set for Jan. 19. In all, the government contends Kelley transferred nearly $3.6 million through a series of accounts, at least $1.4 million of it stolen from clients who were owed refunds on reconveyance fees paid to Post Closing.